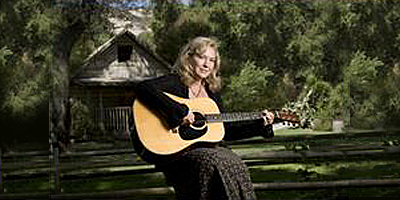 Sheri Lee is a songwriter, vocalist and guitar player from Wildomar, California who released her first CD ten years ago. Her More Than Words CD included a song she wrote called “Julian” that won the Julian Songwriter contest in 1997. 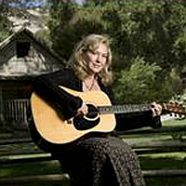 Over the years, Sheri has collaborated with musical luminaries such as Sara and Sean Watkins, Chris Hillman, Herb Pederson, Eric Uglum, Dean Knight and Dave Richardson. In 2005, Dave worked with her to produce her latest CD Where The Blue Sky Ends. I was honored (and still am) to be invited to play lead guitar on one of the tracks on that CD — a song she wrote called “Two Rings of Gold.” In the following interview, I had an opportunity to catch up with Sheri to chat about one of our mutually favorite topics. What motivates you to write and perform original music? I have always been a deep thinker and seem to feel things a little deeper than most people. Here’s how it works for me: It seems that God allows me to go through some pretty tough journeys in life. I say journey because often times it seems so long. At the time it feels like such a hardship. I get through and when the burden starts to lift a little I receive a gift. Usually my songs come out of the experience. This is how I write most of my material. I don’t really have to think hard about the melody, it just comes. There are other ways of writing for me such as others peoples stories, also I dream songs. I wake up in the middle of the night, grab my guitar and stay up for hours working on a tune. Then I will usually call a musician friend to have them play along with another instrument. I’ll start thinking about arrangements and then recording. When all this is completed you can’t help but go out and share this experience in a performance. Maybe I’m a bit biased, but I think that Two Rings of Gold (thanks again for inviting me to record this with you) is a really fine song. Did you write it based on first-hand experience or abstract creativity? There is a lot going on in this song. Yes, part of this is from experience. It may sound like a woman saying that her husband is so free spirited that he can’t stay in the marriage, but in truth a lot of this song exposes my personality as well. I’ll let you guess which parts. Marriage and raising a family is a huge responsibility. The lyrics to the song aside, my husband and I will be celebrating our 28th wedding anniversary this month. Very cool. I know that you and your music have received favorable interest from several folks in Nashville. Aside from writing a bunch of really fine material, what did you do to show up on the radar screen with the Nashville music industry? As you know it takes a lot of perseverance to get your music heard. Especially in Nashville. Sometimes it takes more than just talent. One of the first things I did is join the join the I.B.M.A. This association has a lot to offer to help artists get their music to the public. There are tools, such as the list of all the radio stations around the world, that you can send your music to. Also the Internet and My Space for musicians have helped to sell CDs and downloads of my music. You have to reach out to many people in the industry. Again a lot of hard work and time. Also with all the talent out there today, it is important to have your own sound and stick with what is true to you. What’s your favorite new song among those you’ve written recently? I have recently finished a song that tells the story of a local homeless woman. With all that has been going on with the economy and the world, I think about how anyone of us could end up this way. This woman had a college degree. Based on your experience as a recording artist, performer and songwriter, what advice would you offer to others who are traveling a similar road? If you are serious about doing this professionally you have to remember you have got to put yourself out there. It doesn’t just come to you. I started by entering guitar contests and then songwriter contests. People will become familiar with your music and when they see you working to hone your craft, there’s a trust that develops between you and the people that may eventually hire you to do a show. Or a label that will be interested. The most important thing is that it has to be fun and when you are in front of folks, tell your own story. They will love that. Thanks Sheri. Keep up the great work, and may God bless.